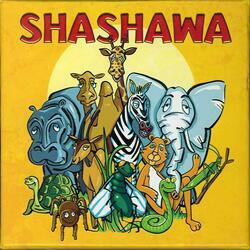 In Shashawa, inspired by a traditional card game, each player tries to collect the four cards from a family of animals as quickly as possible. At the signal, each player passes a card to his neighbour. These exchanges last until a player has four identical cards. The latter shouts "Source! "and all players try to take a source token from the table. The slowest player gets a "drought" token. As soon as a player has 3 "drought" chips he is eliminated. The last two players with the fewest "drought" chips win the game. A game of speed and association for children. Very simple rules to implement. Perfect for birthdays and snacks.